The Under 16 Mutua Madrid Open is back and committed to the future! After the success of the first two seasons, the Under 16 Mutua Madrid Open has decided to double the number of heats in order to consolidate its project for the promotion of grass-roots sport and give more opportunities to the young guns of Spanish tennis. In 2013 the national Under-16 circuit started out with 5 heats and in 2014 this figured was increased to 8 qualifying tournaments around Spain. Now, in 2015, commitment to the tournament has intensified, doubling the number of heats around the Spanish territory to 16. This year new cities Santander, Valladolid, Bilbao, Mallorca, Javea, Sevilla, and Navarra will be added to those from last season: Vigo, Murcia, Madrid, Marbella, Zaragoza, Oviedo, Barcelona, and Valencia. In each of those 16 regional stages there will be a boys' and girls' competition between 16 players, of which 14 will qualify because of their RFET ranking, while the remaining two are reserved for wildcards. In support of these young players, all entries to the regional stages are free of charge. Alberto Berasategui, ex-world number 7 and the competition’s director, has been the main architect of the tour’s outstanding growth: "We were really excited about reaching more cities, more clubs and more kids. Everyone deserves the opportunity to be able to enjoy this experience and have the chance to go on to win in the Caja Mágica". The 32 winners of the territorial stages (16 boys and 16 girls) will obtain their pass (with all expenses paid) to the final stage, which takes place during the Mutua Madrid Open. The winners of the competition will receive their prizes together with the ATP and WTA tournaments. In the last two years, Under-16 winners Eduard Güell, Miguel Damas, Marta Huquing and Marina Basolls had an unforgettable experience with Rafa Nadal, Andy Murray, Maria Sharapova and Petra Kvitova. Manolo Santana, Director of the Mutua Madrid Open, spoke of his satisfaction with the expansion of the competition. "This initiative to expand the Under-16 tournament is great news for Spanish tennis. Last year I went to the heats in Marbella, Barcelona and Madrid and I was very impressed by the level of tennis produced by our young players. I think that this generation will produce some great players". The first year's champion Marta Huqing just won her first professional tournament at the ITF Open Gran Canaria de Las Palmas while Eduard Güell picked up his first ATP points in May. 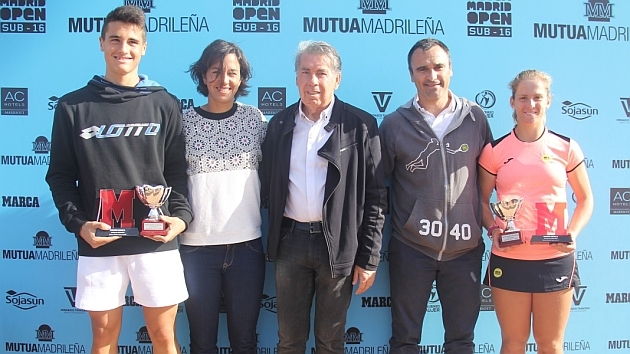 For her part, the champion of the second Under-16 tournament, Marina Bassols, impressed at the ITF Open Castilla y León Villa de El Espinar where she reached the quarter-finals. This is a clear demonstration that the Under-16 Mutua Madrid Open provides a great trampoline to the future. To follow all the information on the Under-16 Mutua Madrid Open, there is a new website (http://www.madrid-open.com/sub16/) where draws, orders of play, and photos from each day can be downloaded. It will also allow players to sign up to the heat they would like to take part in. The goal of this competition is to promote the values of sport and give new opportunities to young athletes who aspire to become professional tennis players. The tennis of the future is here.